One need only to read the Executive Summary of the County of Maui's "Analysis of Alternative Forms of Ownership and Alternative Business Models for Maui County's Electric Utility Company" (Report) prepared by Guernsey, an engineering-architectual and consulting firm hired by the County to understand the need for some spin (Click here for Sierra Club's Statement). Right up front the Executive Summary concludes that a municipal or cooperative form of ownership is not the "ideal" path to achieve and address "[T]he County desires to move to 100% renewable and sustainable energy as quickly as practicable . . . "
The $70,000 Report did state "Guernsey believes the ideal path forward to meet the County's objectives is to organize, develop and enable a private entity akin to an Independent System Operator (ISO) or Regional Transmission Operator (RTO) to oversee the electric grid and energy market while ensuring a reliable power supply, adequate transmission infrastructure, competitive wholesale prices and fair access for renewable power." Hmm, no new revelation there. The evolution of the Hawaiian Electric Companies (HECO Companies) to a new business model is discussed in detail by the Hawaii Public Utilities Commission (PUC) in its April 2014 "Exhibit A: Commission's Inclinations on the Future of Hawaii's Electric Utilities - Aligning the Utility Business Model with Customer Interests and Public Policy Goals." 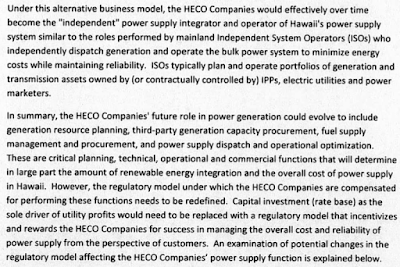 More specifically, in outlining the essential functions of Hawaii's electric utilities, Key Business Function #1, beginning on page 19, is very clear on the PUC's expectations of the HECO Companies under an alternative business model, evolving to an ISO. Other than Governor Ige's LNG pronouncement, I don't know of any disagreement or efforts to derail the roadmap in the PUC's Inclinations. 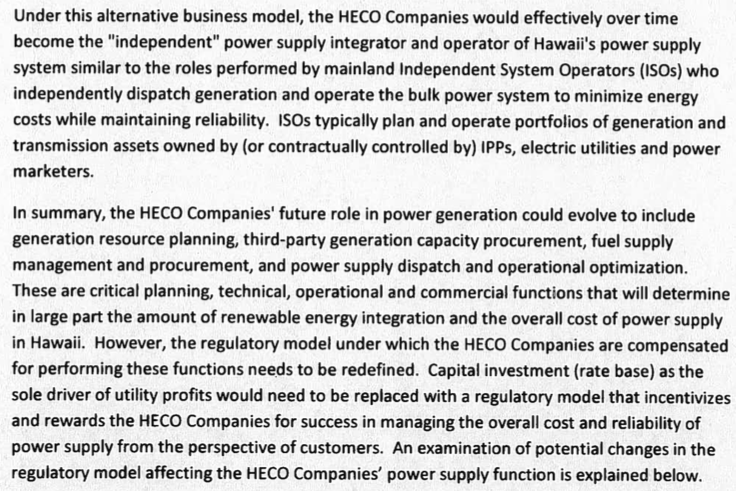 And, interestingly, the PUC's Inclinations have been willingly accepted by the HECO Companies and NextEra has stated that the PUC's inclinations is one of the reasons they became interested in acquiring the HECO Companies. I think one could deduce from the Report that the quickest way for the County of Maui to reach its desired goals is to let the PUC do its job in clearly articulating its expectations of Hawaii's electric utilities as outlined in its Inclinations and then holding the utilities accountable in meeting those expectations, which the PUC already has been doing. The Hawaii State Legislature has delegated the PUC this authority. The Legislature has oversight of the PUC and the responsibility to ensure that the PUC has the proper resources to do their job to regulate this monumental paradigm shift. Most importantly, as the PUC's Inclinations detail, it's not a straight shot to an ISO model but a careful evolution of the utility business model. While Mayor Arakawa may be upset over Maui Electric Company's unwillingness to bail out the County of Maui's efforts to push a high priced power purchase agreement on Maui's electricity customers, this is a pretty convoluted and expensive proposition to deal with one's anger.